Like many people, I have discussed the MH370 loss with colleagues and friends fairly regularly over the past weeks. It never takes long for one of us to ask how we can lose an aircraft in today’s world where surveillance is never far from peoples’ minds, but for its ubiquity rather than its absence. The previous high-profile loss, Air France flight 447 in June 2009, started a push for new technology and regulations. However, because of the relatively low probability of losing an aircraft, perhaps global tracking has not been considered urgent or received the strong financial and political incentives and concerted effort needed to make it ubiquitous. The lack of urgency would seem to fly in the face of the historical record: there have been eleven accidents over water since June 2009 and only one of the black boxes has been recovered! Following the disappearance of MH370, it looks like the momentum for change has finally arrived. Aircraft today already carry equipment to determine their own positions via GNSS (Global Navigation Satellite System) and ELTs (Emergency Locator Transmitter). One such GNSS, GALILEO, will also include SAR (Search and Rescue) receivers to improve coverage/response time and location accuracy of ELTs. In anticipation of future regulatory mandates (e.g. 2017 in Europe), over 90% of all commercial aircraft are also already fitted with equipment for ADS-B (Automatic Dependent Surveillance-Broadcast). ADS-B transponders connect with the relevant avionics systems (GNSS, pressure altimeters, etc.) and regularly broadcast the aircraft’s positional information, readable by anyone with the right receiver. Currently, the receivers are ground-based and therefore cannot provide cover- age in remote oceanic and continental regions. Both MH370 and AF447 were equipped with ADS equipment. The MH370 broadcasts stopped for some reason, possibly disconnected intentionally (pilots can pull circuit breakers as part of their fault-finding and isolation procedures). But even with regular positional broadcasts from the AF447, it took nearly two years of searching and a bit of luck – assumptions revisited, “friendly” seabed terrain – before it was discovered. The AF447 was previously the most expensive aviation search operation, with an estimated final bill of $44 million. This is the same estimated cost for the first month of the MH370 search and, as of the time this goes to press, there is still no end in sight. With two Australian ships costing over $850,000 a day for example, it is difficult to even guestimate the final bill. For next generation ADS-C (C for Contract), satellite technology is already in place and offered by companies such as Inmarsat. It can help with tracking but its main purpose is maintenance support. Aircraft require a modem onboard, but can transmit much more than just positional data. ADS-C presents the heady prospect of on-ground experts assisting the aircrew in real-time and maybe even preventing an accident in the air. However, cost can become an issue for airlines, especially for very frequent transmissions. Space-based technology can already play a role in capturing the position of all aircraft anywhere in the world using existing aircraft equipment. Future upgrades may make that role a more prominent one. 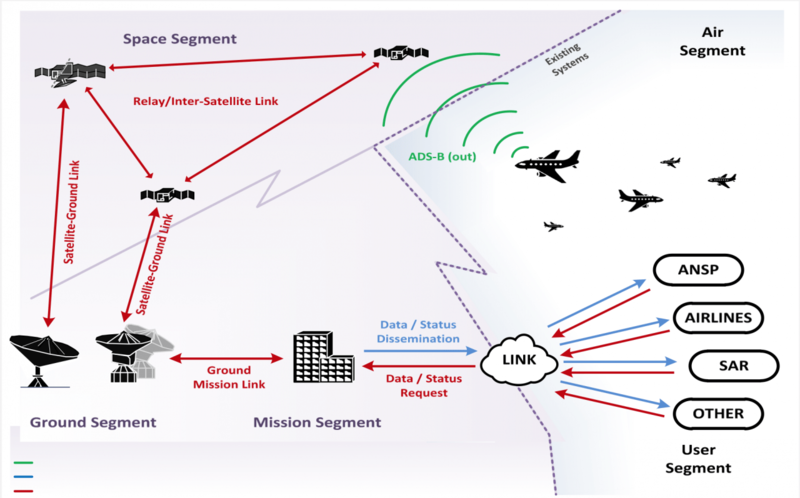 A recently-formed consortium (too young for an official name yet) is developing an ADS receiver payload as part of a European ADS-B satellite constellation. This organiza- tion includes Thales Alenia Space Deutschland (TAS-D), SES TechCom, and German Aerospace Center DLR. TAS-D holds all the patents for satellite ADS-B equipment and plans to market a solution by 2020. Hannes Griebel, Head of the Satellite ADS-B Development Program at TAS-D, told me that they currently plan a dedicated satellite constellation with ADS-B as the primary payload. “This is more expensive, but preferred from a certification point of view. For example, would a satellite with a failed sec- ondary payload be replaced if the primary is working fine?” Griebel also told me that the real challenge has been the environment. For example, the receiver needs to “degarble” all the overlapping messages received from multiple aircraft: “Imagine you are stood in the pitcher position of a baseball stadium. Now try to listen to every conversation between all the spectators.” The computing power needed to degarble is nothing compared to a gaming PC. However, your gaming PC would not work for long, if at all, in space. DLR is currently one year into a two-and-half year flight test program with the very first satellite ADS-B receiver and antenna array onboard ESA’s Proba-V satellite According to Toni Delovski, DLR’s ADS-B-over-Satellite Project Manager, the testing has so far been a success and “proof of concept” for ADS-B receivers in a LEO satellite system has been achieved. Using existing aircraft transponders is key to getting space-based ADS-B off the ground. This presented one challenge with respect to the “cone of silence,” the area directly above an aircraft where its transponder signal cannot be seen. Delovski explained to me how DLR’s experiments on ESA’s Proba-V have characterized the cone of silence: “A LEO satellite traveling at 7km/s at an orbit of between 600 and 700km above sea level closes the gap so quickly that the delay in receiving data is negligible.” That gap expands as the distance between the receiver (satellite) and transmitter (aircraft) increases and as the relative velocity between re- ceiver and transmitter decreases. 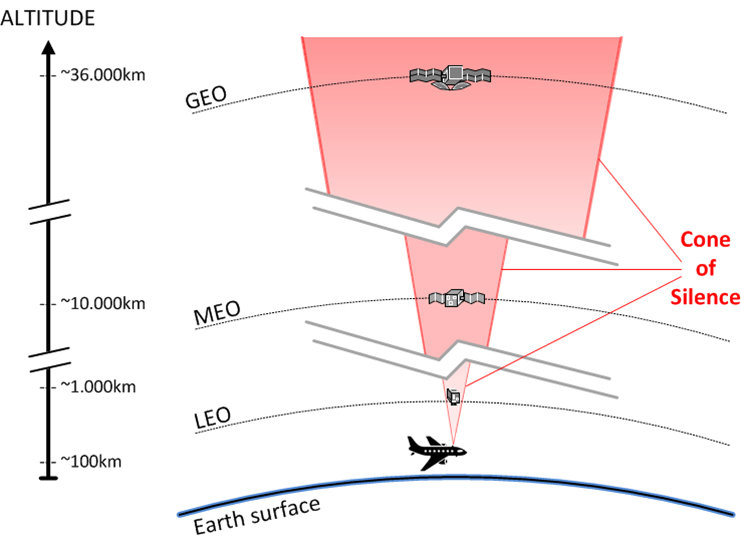 This constraint provides LEO satellites with one advantage over using a GEO satel- lite system which is at a greater distance and relies on the aircraft’s velocity alone to close the gap. At the GEO satellite orbiting height of 36,000km, the gap would be a not-insignif- icant ten hours. After initially leading the ADS-B space race, Europe is now playing catch-up. In America, Aireon is scheduled to launch Iridium NEXT’s LEO satellites between 2015 and 2017. These will include ADS-B receivers (based on TAS-D’s patented design), albeit as a secondary payload. Such competition is both financially and technologically advantageous for the air- line industry: two independent systems offer a back-up op- tion, as well as choice. Providing coverage of the remote parts of the Earth is one challenge that satellite technology can solve. There are others. According to a recent European Union report, the cost of satellite data transmission is around $0.50 per message (a decrease of 90% since 2009) and is expected to become cheaper. The cost of a position report via the Iridium network can be as low as $0.05 per report, using a GNSS sensor by Spidertrack, for example. The size of a potential aviation disaster search area drives how frequently an aircraft should broadcast its position. AF447 was actually close enough to land to be reporting its position every ten minutes. The ACARS messages received before the incident reduced the effective reporting frequency to five minutes. However, the search area was still 17,000 square kilometers and it took nearly two years of search- ing! A positional accuracy of 6 nautical miles is the expected minimum to be required from regulatory bodies and this will require a reporting frequency of around one minute. DLR’s testing on ESA’s Proba-V has shown the update rate of sat- ellite ADS-B can achieve this comfortably. In order to have reliably good data, a downlink every fifteen seconds is being proposed. In addition, Griebel advised, the raw data received by a satellite ADS-B every second or less can be analyzed following an incident to provide a more precise search area. However, if the aircrew can disconnect the system, all this capability will not avoid a repeat of the MH370 case. One solution here is an RLS (Return Link Service) which could allow the satellite control center to remotely switch on the aircraft transponder when required. However, this would need a change in aircraft systems and therefore will need to be mandated before it becomes reality. And before it can be mandated, it will need to be argued that the increased risk of a pilot-independent system on every aircraft is outweighed by the advantage of mitigating the rare event of a deliberate disconnection. The political will in the face of the public attention to the MH370 loss, on top of the multi-million dollar search cost, has certainly helped push the introduction of aircraft tracking up the agenda. ICAO is leading the regulation aspects and held a Special Meeting on Global Flight Tracking of Aircraft in May 2014. Whilst regulations must remain unbiased to the type of technology to be used as means of compliance, space-based technology will play a key role in the solution. I started my research for this article with the surprise shared by many, of how we can lose an aircraft today. Maybe working inside the industry meant I was not quite as surprised as the general public. However, what has surprised me more is the level of maturity of the technology already available and (sometimes) in use. This provides a great foundation to make the necessary improvements and evolve with the emerging satellite technology. By Stuart Baskcomb. Bascomb is a partner in Delta System Solutions GmbH, providing specialized consultancy in safety engineering and management from Munich, Germany. He has spent nearly twenty years in aviation and safety, working for companies such as BAE Systems, Airbus, and Rolls-Royce.